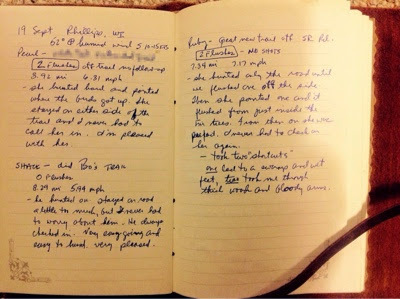 A Bird Hunter's Thoughts: Do You Journal? Or: Have we hunted here before? I started keeping a journal pretty soon after my first bird hunt. I fell into it easily since I was keeping a running journal everyday, so I was used to the routine. My wife bought me this fancy one a few years ago, but I've used notebooks, pads, pen and paper, pencil...anything I can write on. The thing I really like is the way I can open to any page, any book, read a few lines and suddenly, I'm there again. The smells, weather, dogs, hunting partners. The good stuff, the mundane stuff and even a little bad stuff- all of it daily and duly recorded for posterity. At a minimum, I like to know where I was, what dogs, who I was with, how the dogs did, the weather. Now, due to technology advances, I like to put down the distance the dogs ran, the number of birds they point/flush/retrieve. I will put down the motel and phone number, any names I can remember of people I met and phones numbers. Also, any comments I had during the hunt with a particular dog. 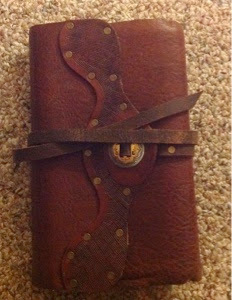 Remember, a diary should contain all the information you need to relive the days- good and other. I've found, that over time, I pretty much remember the good and forget the other stuff! By looking at these few pages, I'll be able to remember when I ran my puppies for their first, long cast in the grouse woods! Get ready for some fireside reading now, while you are still logging entries. The day will come when you will be unable to follow a bird dog up the coulees, across the prairie, through the grouse woods. Consider it like a retirement account. Invest now and reap the benefits later! !